Daniel Valdez, 24, of Mission is a wrestler known as “Danny Chance” is seen during a photo shoot at Cine El Rey on Friday, Oct. 19, 2018, in McAllen. On most days, Daniel Valdez can be found bagging groceries at the H-E-B in Palmview. On Friday nights, however, you can catch him at Cine El Rey, wrestling under his performance alias, Danny Chance. 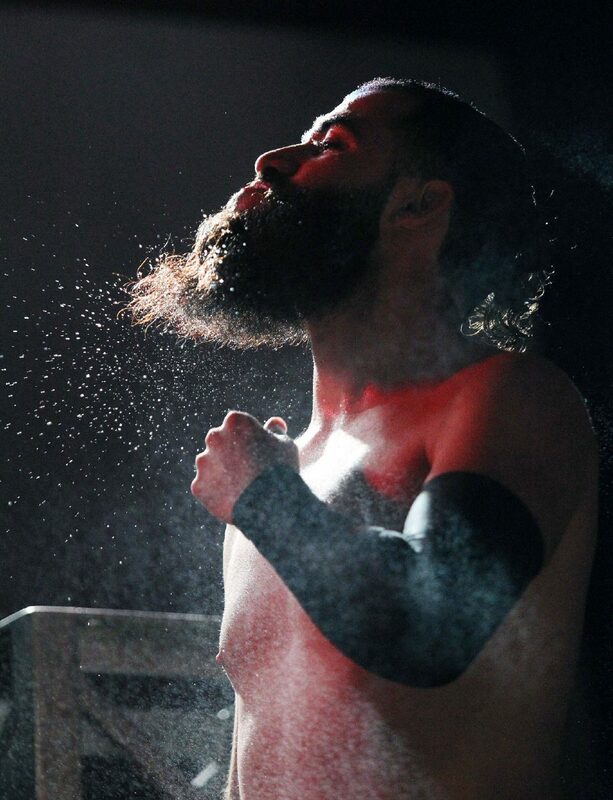 He arrives to the downtown McAllen theater at about 4:30 p.m. and works with a handful of other wrestlers to transform the venue into a makeshift wrestling ring. Valdez changes into his boots and one-piece set of tights that read “Chance” on the back. Novices practice while Valdez sprays himself with water, achieving the signature pro-wrestler sequence. Eight years ago, when Valdez was 16, he was in their shoes. With his parents’ permission, he joined Wrestling Revolution, a local wrestling company based out of McAllen, and started performing matches at the pulga in Alton. The first move he recalls doing was jumping off the top of the ring. All went according to plan on that first jump (thanks to his experience climbing trees as a child). But he has suffered his fair share of injuries during his career. For nearly a decade, he has worked to perfect his stunts without hurting himself while also trying to achieve authenticity. Throughout the years, Danny Chance has developed from “a more energetic, almost like a rabbit,” character to the high-impact wrestler he describes himself as today. Danny Chance has made a name for himself both around the Rio Grande Valley and throughout the country. He often performs at venues in Texas’ larger cities, as well as stages in Louisiana, Colorado and Missouri. “When I’m up there I’m not just representing myself; I’m representing the Valley,” he said. Shooter Roberts, cofounder of Wrestling Revolution, said in a perfect world, Danny Chance would stay performing at Cine El Rey every Friday until the end of his career. However, the more he’s seen wrestlers from Wrestling Revolution perform outside the Valley, the more of a reputation the local wrestling scene develops. In wrestling, “It’s about getting your name out there,” Valdez said. His goal is to make it to World Wrestling Entertainment (WWE) and make “Danny Chance” a household name.